In March 2016, 23.82 percent of the Barnard student body voted on a referendum drafted by the Student Government Association calling upon the college to divest from fossil fuels, which passed with 96 percent support. In March 2017, the divestment decision was made by the Presidential Task Force. President Beilock’s letter to the student body was contradictory and took a side: By denying the referendum in the pursuit of inclusivity, the college is exercising exclusivity and operating through clear financial ulterior motives. The 2017 divestment decision was supported by about 22 percent of the total student body population, yet still passed. The current referendum was supported by 29.9 percent of the total student body, yet was dismissed due to lack of “representation.” President Beilock’s claims raise serious questions regarding the rationale for her objections, which may have been influenced by financial motives. 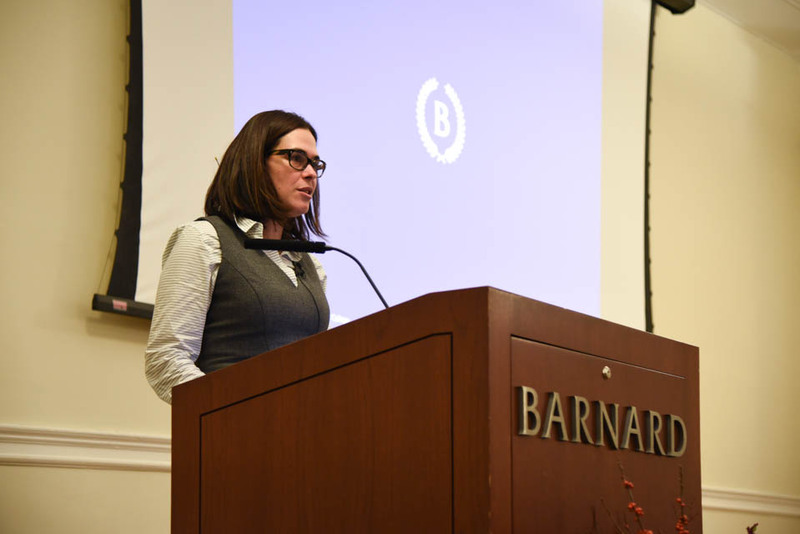 One of President Beilock’s many roles is to oversee and manage Barnard’s budget, as well as raise funds for the school; the referendum would put the funds from donors in jeopardy. The fact that alumnae who support Israel have claimed that they will no longer plan to donate to the college despite previous financial support highlights Beilock’s stance on prioritizing wealthy donor opinion over student voices. Beilock’s words hold an inherent contradiction: She claims “taking an institutional stand amid the complexities of the Mideast conflict would risk chilling campus discourse on a set of issues that members of our community should be able to discuss and debate freely” yet took a stand by dismissing the results of a fair democratic process. Explicitly dismissing a political stance, one voted on democratically, is still taking a position: one opposed to the student body and in favor of a money-oriented administration. Columbia University became the first Ivy League university to divest from corporations that operated in apartheid South Africa. The success of the divestment is all due to the hard work of a coalition of student activists who struggled for months to put pressure on and challenge the University. The protest began with just seven students who blockaded the entrance to the University’s administrative building. The blockade received immediate news attention and was the predominant discussion in classrooms. At its peak, there were 1,000 students taking part in the blockade. What began as a small call for action transitioned into a nation-wide discussion on divestment that transcended the bounds of the University’s campus. The discourse surrounding Palestine and Israel has occurred on Barnard and Columbia’s campus for several years, with individuals on both ends of the spectrum participating in protests and events. To stifle the results of a student-led democratic process on the grounds of it risking “chilling discourse” is overlooking the years of this important discourse. The results of the divestment will not halt discourse; I contend that it will catalyze it. The unfolding of the events that led to Columbia’s 1985 divestment is a testament to the positive effects divestment can have on discussion in a college campus. Now that the referendum has received such widespread attention, students are more likely to engage in discourse and formulate an informed position. Columbia University’s decision to divest did not inhibit the voices of the student activists and deprive them of their right to fight institutional involvement in global systems of persecution and oppression. Beilock’s words are an insult to the tireless effort of the students who worked to set the precedent for college divestments. It is an insult to all the students who actively engaged and familiarized themselves with the referendum in order to make an informed decision. It is an insult to me, a student who attended this college with the belief that my voice would never be overlooked or silenced in the face of contention—contention that points towards the conclusion that student voice is overshadowed by donor opinion. The referendum does not force students to pick a side: pro- or anti-Israel. Rather, it asks students to choose whether they would like to end support from corporations that are directly involved in acts of inhumanity towards Palestinians. A common misconception is that supporting the referendum automatically makes one “pro-Palestine” or “anti-Israel”. This is not the case. Supporting the equal rights of human beings means denouncing the actions of an oppressor, not the oppressor itself. For President Beilock to explicitly disregard the voices of those that voted yes to the referendum is an obstruction of the democratic process. I refuse to allow my college, a college that prides itself for consisting of fervent, progressive, and politically active women, to suppress the voices of these very students in the face of diversity of opinion. I refuse to allow my vote to render as meaningless due to the discomfort of a select few hefty donors. President Beilock, I urge you to retract your statement and demonstrate your emphasized “commitment to the student body” by allowing the democratic process to prevail and ceasing to succumb to external pressures. Janine Nassar is a first-year at Barnard studying human rights and political science and is interested in anything related to politics and social justice.